Cpl. Kira R. Lavine, an air-support operations operator with Marine Air Support Squadron 3, Marine Air Control Group 38, 3rd Marine Aircraft Wing, sets two swimming records during the 2018 Department of Defense Warrior Games, a multi-day competition at the U.S. Air Force Academy in Colorado, June 1 – 10. Both active duty and veterans, competed in a variety of categories including archery, cycling, wheelchair basketball, track and field, sitting volleyball, shooting, swimming, indoor rowing, time trail cycling and powerlifting. During the games, Lavine set two swimming event records in both the 50-meter and 100-meter freestyle. She also placed second in the 50-meter backstroke, first place in the 50-meter breaststroke, first place in the 200-meter freestyle, fifth place in an indoor four-minute endurance rowing race and seventh place during the one-minute rowing sprint race. “I was mostly just impressed with my time,” said Lavine. “Thinking about the record wasn’t really a big deal, I was trying to beat my personal best. Because Lavine did well, she qualified for the games, which led to another level of athleticism because she was competing against women who were really good swimmers. “It’s more fulfilling when you succeed with talented opponents,” said Lavine, who recalled first learning to swim in her grandparents’ pool at the age of four. Lavine’s mother, who was both a competitive diver and swimmer at Valhalla High School and San Diego State University, continues to be her role-model. Over the years Lavine has dedicated her free time to improve her swimming. With a steadfast focus, determination and incomparable spirit that has benefitted not only her personal life, but her military career as well. As an air-support operations operator with an aviation command and control unit, Lavine provides direct air support for I Marine Expeditionary Force and its major subordinate commands. 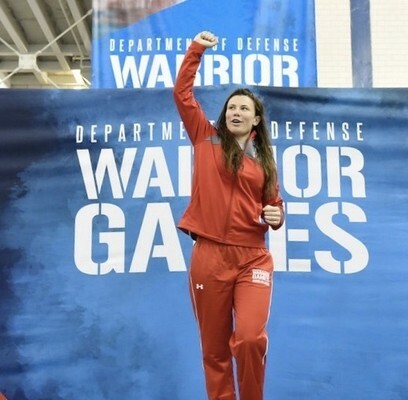 While preparing for the Warrior Games, her unit released her early for practice during lunch breaks as part of her every day routine in an effort to improve on her swimming.